Most of today’s structured data is stored in relational data- bases. Such a database consists of multiple relations that are linked together conceptually via entity-relationship links in the design of relational database schemas. Multi-relational classification can be widely used in many disciplines including financial decision making and medical research. However, most classification approaches only work on single “flat” data relations. It is usually difficult to convert multiple relations into a single flat relation without either introducing huge “universal relation” or losing essential information. 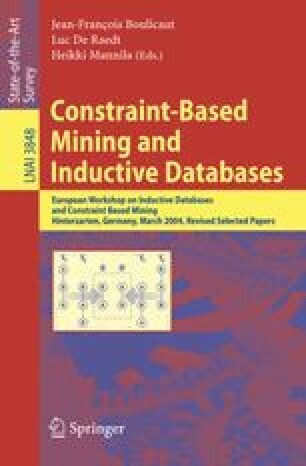 Previous works using Inductive Logic Programming approaches (recently also known as Relational Mining) have proven effective with high accuracy in multi-relational classification. Unfortunately, they fail to achieve high scalability w.r.t. the number of relations in databases because they repeatedly join different relations to search for good literals. In this paper we propose CrossMine, an efficient and scalable approach for multi-relational classification. CrossMine employs tuple ID propagation, a novel method for virtually joining relations, which enables flexible and efficient search among multiple relations. CrossMine also uses aggregated information to provide essential statistics for classification. A selective sampling method is used to achieve high scalability w.r.t. the number of tuples in the databases. Our comprehensive experiments on both real and synthetic databases demonstrate the high scalability and accuracy of CrossMine. The work was supported in part by National Science Foundation under Grants IIS-02-09199/IIS-03-08215, and an IBM Faculty Award. Any opinions, findings, and conclusions or recommendations expressed in this material are those of the author(s) and do not necessarily reflect the views of the funding agencies.